Vampire Edition Storyteller Screen in Rust Design. The ultimate roleplaying game of personal and political horror, Vampire: The Masquerade, has launched its fifth edition this year. Dog Might Games, the makers of amazing custom Gaming Gear, have partnered with White Wolf to produce officially licensed products to ensure you attend your next Elysium in proper style. All official VtM gaming gear comes with exclusive V5 Loresheets for Geek & Sundry's LA BY NIGHT, a live-streamed tabletop RPG series featuring the new 5th edition of Vampire: The Masquerade. Jason Carl (White Wolf Head of Community) will take Geek & Sundry's players and viewers through a world rich with adventure, intrigue, and political machinations as creatures of the night battle or bargain for supremacy in modern Los Angeles. The eight-episode series will be streamed every Friday night beginning on September 14th at 8pm PDT on twitch.tv/geekandsundry and projectalpha.com. NOTE: To avoid spoilers for the Geek & Sundry live-streamed series, Loresheets will not be distributed until after the final LA BY NIGHT episode on Friday, November 2nd, 2018. Vampire Sheath in Night with Ankh Inlay. Vampire Sheath in Blood with Toreador Inlay. Vampire Sheaths with Lasombra Inlay. Organize your Kindred gear in our official Vampire Sheath. Each Vampire Sheath is sized to fit over 20 dice as well as pens and pencils, everything you need for your hunt. Our 'Night' Vampire Sheath is crafted out of the most sinister of woods, Wenge, and is inlaid with solid Maple in your choice of official Clan Symbol. Our 'Blood' Vampire Sheath is crafted out of gorgeous Red Heart and inlaid with solid Maple hardwood in your choice of Clan Symbol. Double coated with custom lacquer for a lifetime of protection, and backed by our lifetime guarantee. Unite the Clans under one Sect with this four pack bundle. Includes 4 Vampire Sheaths with your choice of clan symbols. Double coated with custom lacquer for a lifetime of protection. 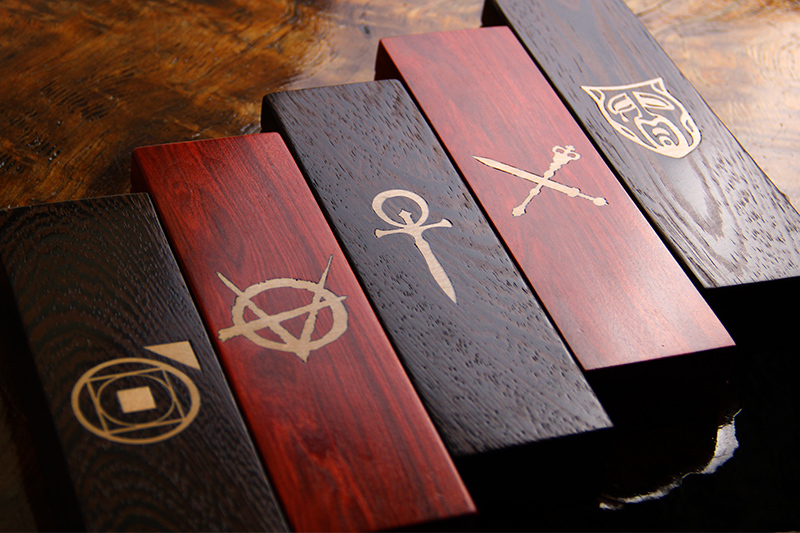 Email info@dogmight.com with the Design and Clan symbols for all four Vampire Sheaths. Vampire Edition Storyteller Screen in Death Design. Vampire Edition Storyteller Screen in Chicago Design. Our Vampire Edition Storyteller Screens are true works of art. Features 3 solid hardwood panels made from African Wenge with a Catalyzed Lacquer finish. Each panel bears a hand cut aluminum Vampire: the Masquerade Ankh. The Rust Style features a hand cut weathered steel skyline on the center panel, and weathered bolts across all panels. The Death Style features a gorgeous sculpted Skulls and Roses motif on the front panel. The Chicago Style features a hand cut aluminium skyline on the center panel. The screens are fitted with magnets on the ends and snap firmly to lacquered Re-Bar, allowing for easy adjustment on your table. For the Storyteller, each screen features magnets on the interior panels along with magnetic Plexi-glass panels for note taking and 10 steel bearings for securing charts and tables. 6 Plexi-glass Story Trackers fit anywhere along the top of the panels for quick changes in party order. Each panel measures 12 x 8 x 0.65". Upgrade your Storyteller Screen below with additional plexi or metal Story Trackers, and optional rolling tray. Add an additional 6 Story trackers to your Storyteller Screen. Available in Plexiglass and Hand Cut Aluminium Metal. Works alone or in conjunction with the Storyteller Screen. 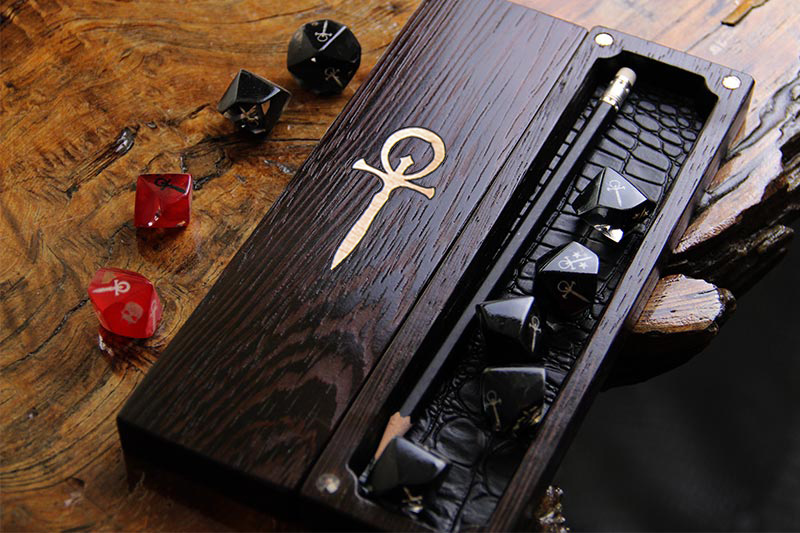 Our Vampire Edition Rolling Tray is crafted out of African Wenge and features Lacquered Re-Bar dividers for your dice. The front rail contains Copper lined eyelets with matching magnets in the rear rail for holding the Lacquered Re-Bar in different configurations. Each Rolling Tray comes lined with Brown Cross Hatch lining and Nickel corners. Trays measure 10 x 5 x 1.5". Vampire Sheaths in Blood with Clan Symbol Inlay.